Yes, you heard it right Voyager1 has left our solar system and entered into the deep space and it happened long years ago. In August 2012, Voyager 1 entered the interstellar space. It took 35 years to reach there. Now its 2017 Voyager 1 has covered 20,604,134,736 KM and gradually increasing (check out) He is not alone out there. He has a twin known as Voyager 2. These two twins are alone in the outer space Voyager 2 as launched a few weeks after Voyger1 was launched. Why they are so important for us? Voyager has added a new chapter in human scientific dream and endeavors. They were the first spacecraft to take a closeup look at Jupiter, Uranus, Saturn, Neptune and their faraway moons. 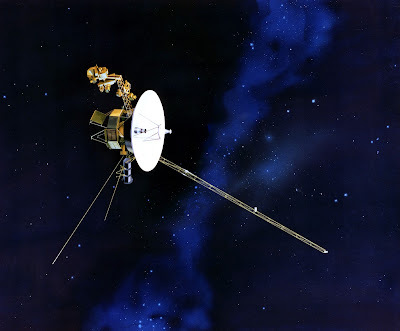 Each Voyager space probe carries a gold-plated audio-visual disc in the event that the spacecraft is ever found by intelligent life forms from other planetary systems. The disc carries photos of the Earth and its lifeforms, a range of scientific information, spoken greetings from people such as the Secretary-General of the United Nations and the President of the United States and a medley, "Sounds of Earth," that includes the sounds of whales, a baby crying, waves breaking on a shore, and a collection of music, including works by Mozart, Blind Willie Johnson, Chuck Berry, and Valya Balkanska. Other Eastern and Western classics are included, as well as various performances of indigenous music from around the world. The record also contains greetings in 55 different languages. It also contains songs of different language and culture here is the song list. As Sanskrit is believed to be one of the ancient languages. India has a collection of some ancient mythological books and story but there is no proof from where those books came to earth. According to us God has gifted us to know the meaning of life and does anyone knows where God live, I guess no one knows. That is the reason NASA added those languages. In case extraterrestrial finds those SpaceCraft and understand those messages sent by us at least they will know once there was life on the earth because one day our planet will die like other planets die. There are total 4 spacecraft out there in deep space.